"Words cannot even express my gratitude, appreciation and respect for Donna! 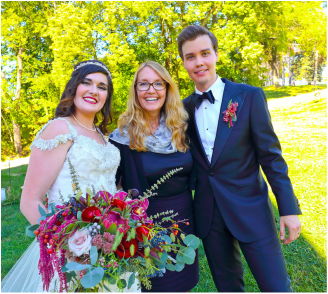 She was not only an incredible celebrant, but she is also a wonderful person who is organized, professional, and kind. She made everything so convenient and easy for us and kept in touch throughout the wedding planning process. She is extremely open to creative ideas to create a personalized ceremony, she is incredibly versatile, and she adapts to your interests. She also helped provide numerous ideas, passages, and outlines for how to create a unique and special ceremony just for us when we needed guidance. She interviewed us about each other, our relationship, and our families and incorporated it into the ceremony. It was so personal and really felt like she had known us forever. 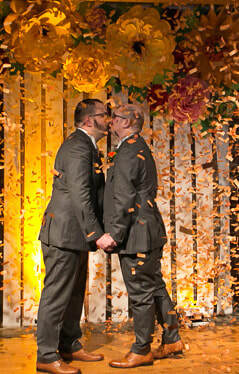 We are still getting compliments on how meaningful and romantic the ceremony was (which was exactly what we wanted:). She's also incredibly thoughtful and dressed in a beautiful professional manner and purposely stepped aside so the photographer captured perfect pictures of the kiss. She made the whole ceremony experience so special and personal and truly added to the day. It's evident that this is not just a job to Donna, but truly a passion and creative process that she perfects for each wedding that leads to happiness for her and her clients! Hiring Donna Forsythe is a MUST do!" "Donna worked closely with us to hand-craft a ceremony to meet our needs. She worked with us to incorporate both secular and sacred rituals and readings into a ceremony that was perfect for us. Many of our guests complimented her warm presence and easy yet professional manner. She anticipated our needs (wedding day nerves!) and met them before we even knew what we needed. Even very religious family members who were at first reluctant to the idea of a Humanist Celebrant were moved by how personal and meaningful they found our ceremony to be. We highly recommend Donna!" "Donna was such a joy to work with. Ryan and I couldn't have felt more lucky that we found her. She was quick to get back to us, and was very accommodating with being able to meet with us since we live outside of PA. We met over coffee, and in the hour that we spent together it was as if we were reconnecting with an old friend. It was as if she already knew us, and made us more comfortable about the whole wedding process. She helped guide us through writing and selecting vows, the flow of the ceremony, and really got to know our story. In the months leading up to the wedding she was there to review our selections, and make sure we had everything we needed for our big day. When we sat down to review the final draft of our ceremony, we were both astounded at how beautifully Donna had put our story into words. She is truly passionate about what she does, and it shows in all the care and detail she puts into making your ceremony unique to you as a couple. Thank you so much for helping make our day unforgettable! We will definitely be recommending Donna's services to friends and family!" Videography by James Boburka Cinematography.